HONG KONG, Apr 29, 2018 - (ACN Newswire) - Rapid advances in mobile technology and Internet accessibility are revolutionising shoppers' behaviour at a breathtaking pace, with digital-savvy consumers driving fundamental change in businesses and the market. 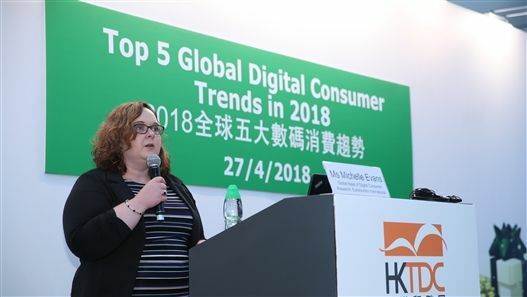 Five key relevant trends and the need for commerce to keep up with them to stay relevant were underlined at a 27 April seminar themed "Top 5 Global Digital Consumer Trends in 2018", held during the 33rd HKTDC Hong Gifts & Premium Fair at the Hong Kong Convention and Exhibition Centre. The seminar was presented by Michelle Evans, Global Head of Digital Consumer Research, Euromonitor International, the world leader in global strategic research for consumer markets. As the overseer of Euromonitor's research on today's digital consumers, she noted there are now 3.6 billion global Internet users, or half of the world's population, with 53% saying they would be lost without the Internet - a clear indication of "the Internet getting more and more entwined in our daily lives." Ms Evans defined three "Internet megatrends" that directly affect commerce: 'Connected Consumers', namely tech-savvy shoppers; 'Shopping Reinvented', the trend towards seamless shopping by smartphone; and 'Experience More', reflected by today's consumers spending more on experiences than 'things'. Technology serves as an enabler of all these megatrends, she said, with 28% of Connected Consumers using a phone to compare prices in shops on a weekly basis. Ms Evan went on to identify five key trends on how technological advances are reshaping the way consumers shop and spend. The first of these trends is the so called 'super apps' - multi-functional, all-in-one apps such as China's WeChat, combining almost every aspect of a consumer's world from utilities, lifestyle and finances to shopping and communication into a single mobile platform. "WeChat is this revolution's posterchild, giving the world a preview of where the Internet is going," said Ms Evans. In the meantime, Western tech titans including Alphabet, Apple and Facebook are "tiptoeing into the area", with Facebook the closest, she said. China's leadership is understandable, she noted, given the world's most populous nation dominates mobile Internet subscriptions with more than 1.1 billion, approximately three times the number in the United States. With China's "mobile first mentality", WeChat is also the top social platform globally, with more than a billion users. "Old habits die hard in the US, with an established way of doing things," she said, "while Asia-Pacific consumers have embraced all-in-one super apps, because they offer a cohesive experience." The implications for businesses is that a "new breed of competitors is emerging", responsive to evolving consumer expectations. There is a clear reason why tech giants like Apple, Microsoft, Amazon and Facebook, along with Chinese counterparts such as Alibaba and Tencent, are valued highest in the world, said Ms Evans - because they possess the most data. This means they can craft individually tailored experiences for consumers, in high demand because today's consumers all "want to be seen as distinct from one another, and desire unique experiences and individually-tailored stories", said Ms Evans, adding this is the second digital-age consumer trend. Artificial Intelligence can greatly empower this personal touch, illustrated by Netflix recommending films or TV series based on what a viewer has recently watched; or Amazon recommending similar books, she explained. On the flip side, she said "data privacy issues continue to plague data uptake", with Facebook hitting the headlines and 50 per cent of consumers considering target ads an invasion of privacy. Empowerment is now shifting to consumers, she noted, as the European Union's "sweeping new privacy laws" threaten fines of four per cent of global revenue, or EUR 20 million, for infringement. "Even companies exporting to Europe can be at risk," she cautioned. The new digital era is also boosting the business model of subscription purchasing, said Ms Evans. While baby boomers, Generation X and Generation Z have been wary of subscriptions, 50 per cent of Millennials are now embracing it - most notably for entertainment, such as movie streaming and gaming. This is another new trend, noted Ms Evans. The boom in subscriptions like Netflix is now spreading to food and beauty. "Subscription is reinventing consumption," she said. The day is coming when Artificial Intelligence in the forthcoming Internet of Things era will predict when we are running out of detergent, for example, based on past purchasing pattern, and know when we need to replenish. But again, there is a flip side. "Machine-led commerce will re-define what brand loyalty means," she cautioned. "By signing-up to automated orders, such as detergent, subscription locks-out other players, now left on the outside looking in. So it's a bit frightening." Another consumer trend is the use of the mobile wallet, said Ms Evans. Consumers are in motion, traveling more than ever before, with China a major driver of growth as the world's fastest-growing travel market - predicted to take 225 million international trips by 2030. Since they expect the same payment convenience wherever they go, the playbook of card networks opens for "global expansion, strengthening the upward trend of digital payments", said Ms Evans. Most prominently, Alipay, the mobile-based payment tool of China's e-commerce giant Alibaba, is "moving west as Chinese spending power grows", forging global partnerships to make spending easier on the go. Already supporting payments in 27 currencies across 30 countries, Alipay has even extended as far as Los Angeles taxis. As such, Euromonitor expects US$3 trillion in payments expected to be made via mobile device by 2022, with China reaching US$2.1 trillion and the US accounting for US$1.6 million, together contributing to 75 per cent of the market. "Mobile payments are a big space to watch," she said. Despite the growth in e-commerce, physical outlets - such as shops, stores, restaurants and entertainment venues - will always "remain a critical part of the consumer journey", said Ms Evans. "But digital is changing a number of competitive realities," she said, as the trend moves towards outlets utilising various technologies to "reimagine the experience". Ms Evans predicted more and more near-field communication (NFC) tags, 3D imaging and virtual and augmented realities in retail outlets, noting that Britain's Thomas Cook travel agency now enables customers a sneak preview of where they can book holidays with VR headsets. Tottenham Hotspur football club is this year opening a new state-of-the-art stadium promising the "ultimate game day experience", complete with mobile entry and sales. Self-service pubs are pouring craft beer on tap via mobile, with waiting staff no longer present to serve, but mostly to provide IT tech support. "Technology is re-inventing the way commerce is unfolding," Ms Evans added. "Outlets are getting a tech injection, leveraging a plethora of technology re-imagining new spaces. It's important that business and commerce keeps up with these trends to stay relevant in the future."